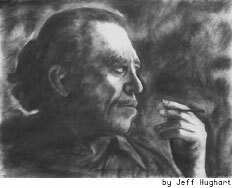 From 1991-1994 Charles Bukowski contributed several poems and short stories and letters to Half-Truth Magazine. Soon a book of this material will be published and sold here. Hank Chinaski was an autobiographical character that Bukowski used in four novels, as well as in many short stories and narrative poems. Similar to Hemingway's Nick Adams, Joyce's Stephen Dedalus, or Kerouac's Jack Dulouz (or Sal Paradise). Because of his totally honest style of writing, it is difficult to tell where Hank Chinaski ends and Bukowski begins. Many people consider the character and the man to be one and the same. Without a doubt, Chinaski is certainly a version of Bukowski, and they do overlap, but they are independent of each other. For example, the fact that Charles Bukowski, the author, was an intense and prolific letter writer, corresponding on a regular basis with many different people, and that he personally answered nearly all mail directed toward him, contrasts greatly with the image of Henry Chinaski, the disenfranchised outsider, fiercely independent. Also, the narrator of the poems, and also the narrator of the shorter stories, seems a somewhat different person than the Chinaski of Post Office.